During January 2016 I photographed some nighttime landscape photographs of Donnington Castle and the Kennet & Avon Canal using a Sigma Art 24mm f1.4 lens & Nikon D810 camera. I have to admit many of my landscape photographs captured at night are usually long exposures at fine ISO settings which can cause movement in tops of trees, nearby foliage and distant clouds. Sometimes this effect looks great but using a fast lens like an f1.4 stopped down to f2 gives excellent sharpness on a prime lens and allows myself to capture less movement in the images themselves due to faster shutter speeds. 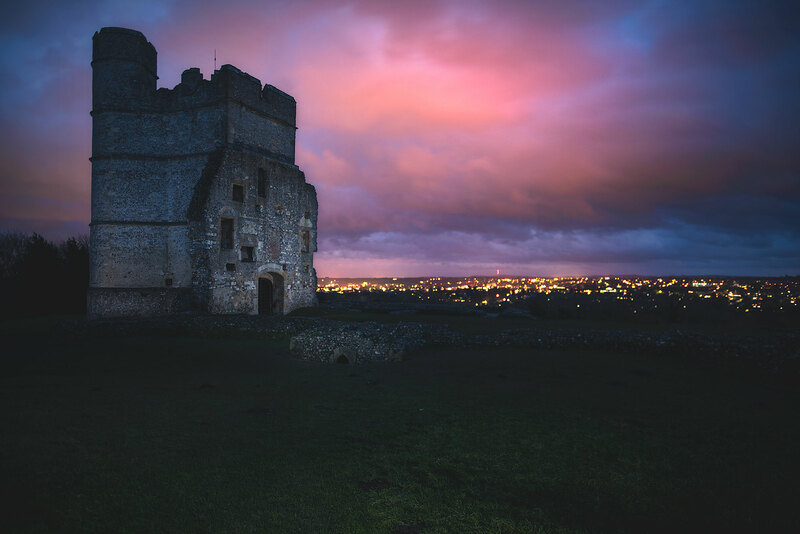 This is one of the reasons I’ll be using faster lenses in my low light photographs besides the creative fact that you can introduce blurred bokeh effects like the Donnington Castle photograph below even when using a wide angle lens like a 24mm. You’ll notice that the Castle below was photographed at f1.4 and the Castle its self was positioned about forty feet (and possibly more) away from the cameras lens. However, shooting wide open still allowed me to blur the street lights of Newbury (Berkshire) in the background and maintain detail in the clouds. I also just about made it to the castle before dark (cycling on my mountain bike). I originally tried a different angle but wasn’t quite able to fit the castle in using the 24mm lens so I chose an angle further away from the castle which worked out well because you can clearly see the street lights of Newbury and as far as wash common in the background. Being a Newbury Berkshire based photographer I often shoot in local areas near to me and I’ll often head out with my camera gear to test new concepts and lighting effects by mixing both ambient and strobe lighting into my images. I’m always looking out for new possibilities in Newbury for photographing landscape and architectural photographs. 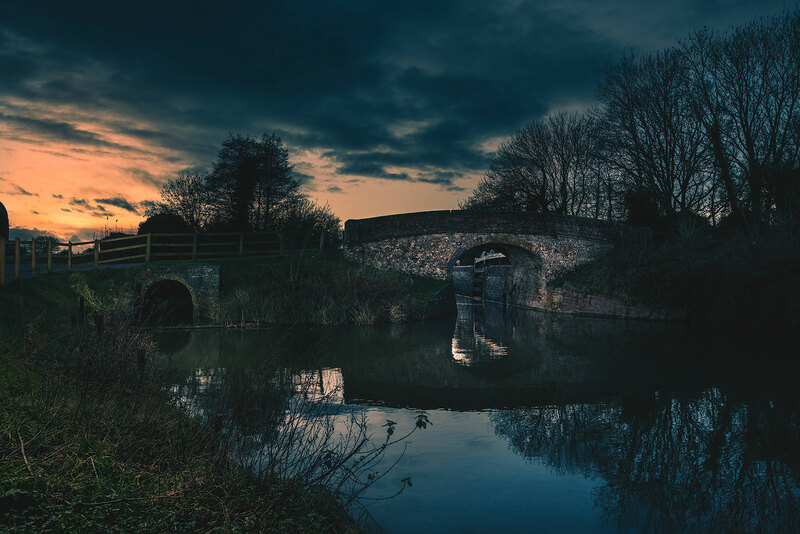 The Kennet and Avon photograph was the first photo I captured using the 24mm f1.4 Sigma Art lens. The shot was simply a test to look at how the lens performs at f1.4 and I’m more than happy with the results. I fired off a flash into the surrounding grass to add in some finer areas of detail that would have been completed masked in dark shadow. This is another reason for shooting with wider apertures because they let in more light. Letting in more light means I can set my flash gun to 1/4 power and still light up the majority of my subject / composition at ISO 64. Recently I brought some models into my landscape photographs which added extra meaning into my images. This obviously adds further complexity and technical considerations to think about but it also adds the possibility of being able to capture my subjects in beautiful landscapes. I have also recently purchased the 20mm f1.4 Sigma Art lens and I am looking forward to using it to open up further creative possibilities to my photography.